Maybe you didn't know but Three Musketeers was originally three bars: Chocolate, vanilla, and strawberry. Yum, yum, yum! Seven Ups were 3nd favorite candy bar after Hershey's Chocolate Bar! I especially liked the jelly [art! boy do i miss this candy bar. These I remember, they were great. I had never heard of SkyBars, I guess they were not a Midwest thing. I've never even heard of a "Seven Up candy bar". It sort of seems like a "Skybar" on steroids. Hey, this reminded me of Chuckles multi-flavor jelly candy, which I've just added to the gallery. 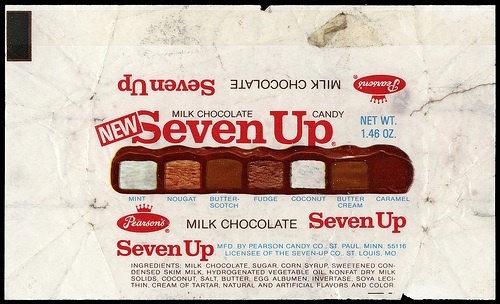 I hated the dark chocolate version of the Seven Up Candy Bar--but as much as I didn't like them, my mother loved them.